Open the Image Manager (see Manage your Images). Click the Image you want to edit, then click to open the Image Editor. Click the Download Image button to download a max resolution copy of the Image to your computer. Redframe only keeps resized copies of your Images; we do not keep your original Image files. You can set the maximum resolution of your resized Images when you Upload your Images to a Gallery. 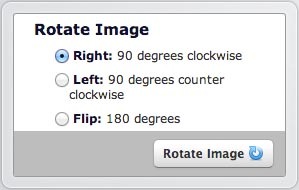 Click the direction you want to rotate your Image. Click the Rotate Image to apply the rotation to your Image. Click into the field under Enter your New Image Name, then type your new Image name. Do not use .JPG or any other file extension in your name; Redframe will add the file extension automatically. Click the Update Name button to update the Image name. In the input field under Enter Caption, type the Caption for this Image. Click the Update Caption and Keywords button. Captions are displayed above the Large Image preview if Captions are enabled for the currently Gallery (see Advanced Gallery Settings). Even if you have Captions disabled for a Gallery, your Caption information will still be embedded for SEO results (see Add SEO to your Images). In the input field under Enter Keywords, type the Keywords for this Image, separated by commas. Keywords are used by the Search Feature to find your Images on your website (see Use the Search Feature). Keywords are also embedded for with each Image for SEO results (see Add SEO to your Images).